Brilliant Pakistani-American writer Zarina is focused on finishing her novel about women and Islam when she meets Eli, a young convert who bridges the gulf between her modern life and her traditional heritage. But when her conservative father and sister discover her controversial manuscript, they are all forced to confront the beliefs that define them. From Ayad Akhtar, the Pulitzer Prize-winning writer of Disgraced, comes a thrillingly fierce and funny new play about identity, religion and the contradictions that make us who we are. Generous support for The Who & The What provided by The Shubert Foundation and William & Flora Hewlett Foundation. Run time is approximately 1 hour and 40 minutes with no intermission. MTC provides advisories for each production regarding special effects that may affect patron health and physical sensitivities as necessary. MTC does not provide advisories relating to content, because content sensitivities vary from patron to patron. 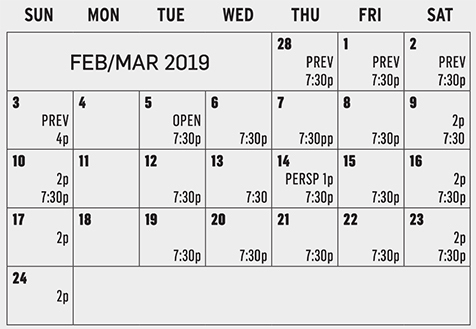 If you have questions about content, please contact the box office prior to purchasing your tickets as we do not offer refunds to patrons who choose not to see a show based on subject matter. Annelyse is thrilled to make her MTC debut in her favorite play. (Shhh - don’t tell the others!) Hailing from Chicago, previous credits include Christmas Mubarak (Silk Road Rising), East by East East (Second City Blackout Cabaret), Our Town, A Christmas Carol, The Who and the What (u/s), Guys and Dolls (Milwaukee Rep); Fantastic Super Great Nation Numero Uno (u/s, The Second City, E.T.C.) Orange (world premiere, Mixed Blood Theatre), Phoenix¸(Nomades), The Who and the What (u/s, Victory Gardens), and Coupled: Your love story, improvised! (Second City Skybox). Film/TV credits: Dhoom 3 (dir. Vijay Krishna Acharya), Horse Camp (dir. Joel Paul Reisig), Jimmortal (dir. Bradley & Weber; winner Best Actress in a Pilot, Chicago Comedy Film Festival). Undying gratitude for her unfailingly supportive husband Brian, and to her crazy Muslim-Christian, Indo-German family. I wouldn’t be this fun without you. Keep in touch at annelyseahmad.com. Alfredo Huereca, actor and filmmaker, winner of multiple Best Actor Awards from ACE-NY (New York Latino Critics Association) and HOLA (Hispanic Organization of Latin Actors) in New York City. With Masters degrees in Acting from UT, Austin and a MS in Education from Baruch College of Public Affairs, NYC, Alfredo has performed in over 50 stage productions, both in English and Spanish. TV appearances include NBC’s The Blacklist next to James Spader and regular roles in Spanish film and TV series for Telemundo, Televisa, Sony Entertainment, such as La Bandida, Ruta 35, Eva La Trailera, El Rey Del Valle, Cosita Linda, Doña Flor y Sus Dos Maridos, Mary for Mayor, Penalty Kick.He plays Martin Madrazoin Rockstar Games’ Grand Theft Auto V. He wrote, produced and starred in Cadena Perpetua, the short film, receiving 19 nominations and 11 international awards. Denmo Ibrahim is thrilled to make her MTC debut. An actor, playwright, and poet, she was last seen on stage as Mariam in A Thousand Splendid Suns at Seattle Repertory. Some U.S. credits include A.C.T., The Old Globe, New York Theatre Workshop, California Shakespeare Theater, Aurora Theatre, Crowded Fire, and Yerba Buena Center for the Arts. She has collaborated with playwrights Mac Wellman, Eric Ehn, Yusef El Guindi, Kristoffer Diaz, Thomas Bradshaw, Melinda Lopez, Dustin Chinn, and Tanya Saracho and originated roles with composers Claudio Bohorquez, Rinde Eckhert, and Carla Kihlstedt. Her devised work has toured to international festivals in Egypt, France and Germany. She is the recipient of a Theatre Bay Area Award and a San Francisco Bay Area Theatre Critics Circle Award. Ibrahim has an M.F.A. in Lecoq-Based Actor-Created Physical Theatre from Naropa University and a B.F.A. in Acting from Boston University. She is a founding artistic director of Mugwumpin and a resident artist of Golden Thread Productions. Ayad Akhtar was born in New York City and raised in Milwaukee, Wisconsin. He is a novelist and author of American Dervish, published in over 20 languages worldwide. His play Disgraced won the 2013 Pulitzer Prize for Drama, ran on Broadway at the Lyceum Theatre, and was nominated for the 2015 Tony Award for Best Play. His plays The Who & the What and The Invisible Hand received Off-Broadway runs and are currently being produced around the world. His most recent play, JUNK received its world premiere at La Jolla Playhouse in 2016 and opened on Broadway at Lincoln Center Theatre in the fall of 2017. Akhtar was listed as the most produced playwright for the 2015/16 Season by American Theatre magazine. As a screenwriter, he was nominated for an Independent Spirit Award for Best Screenplay for The War Within. He is also the recipient of an Award in Literature from the American Academy of Arts and Letters, two OBIE Awards, a Jeff Award, and the Outer Critics Circle John Gassner Award. Akhtar was a Resident Playwright at Arena Stage and has received fellowships from MacDowell, Djerassi, the Sundance Institute, Ucross, and Yaddo, where he serves as a Board Director. He is also a Board Trustee at PEN/America and New York Theatre Workshop. Hana S. Sharif is a director, playwright, producer and currently serves as Associate Artistic Director at Baltimore Center Stage. She served as Associate Artistic Director, Director of New Play Development, and Artistic Producer at Hartford Stage; Program Manager of the ArtsEmerson Ambassador Program; and as Developmental Producer/Tour Manager of Progress Theatre’s musical The Burnin’. Hana also served as co-founder and Artistic Director of Nasir Productions, which brings theatre to underserved communities. Her regional directing credits include: Sense & Sensibility, The Christians, Les Liaisons Dangereuses, Pride & Prejudice (DCArts: Best Director/Best New Play), The Whipping Man, Gem of the Ocean (six CCC nominations), Gee’s Bend (CCC Award Best Ensemble, two nominations), Next Stop Africa, Cassie, The Drum, and IFdentity. Hana has directed numerous developmental workshops, including Elyzabeth Gregory Wilder’s The Chat and Chew Supper Club, Janine Nabers’ A Swell in the Ground, and Marcus Gardley’s The House That Will Not Stand. Her plays include All the Women I Used to Be, The Rise and Fall of Day, and The Sprott Cycle Trilogy. Hana is the recipient of the 2009–10 Aetna New Voices Fellowship and Theatre Communications Group (TCG) New Generations Fellowship. She serves on the board of directors for the Greater Baltimore Cultural Alliance and the Sprott Foundation. Liz Matos (Stage Manager): Liz is delighted to be a part of The Who and The What, her third production with Marin Theatre Company. Locally, Liz has also worked with Marin Shakespeare Company, Magic Theatre, The Cutting Ball Theater, A.C.T. Conservatory, and PlayGround. She is a graduate of Dartmouth College and is a proud member of Actors' Equity Association. Local work: Marin Theater company: Syncopation, The Puppet Master of Lodz, The Price; California Shakespeare Theatre: THE WAR of the ROSES, PYGMALION, THE TEMPEST, Candida, Twelfth Night, MAN AND SUPERMAN, RESTORATION COMEDY, THE LIFE AND ADVENTURES OF NICHOLAS NICKLEBY, PARTS One and Two, The Skin of Our Teeth, The Taming of the Shrew; Berkeley Repertory Theatre: RED, THE LIEUTENANT OF INISHMORE, HEARTBREAK HOUSE, THE PILLOW MAN, Fraulein Elsa, THE MAGIC FIRE; American Conservatory Theatre: THE CONSTANT WIFE, THE HOUSE OF MIRTH, The Guardsman; Theatre Works: Water by theSpoonful, TIME STANDS STILL; Aurora: founding production of Dear Master well as many others. Mrs. Oliver’s work has also been seen at the Seattle Repertory Theatre, Old Globe (San Diego), La Jolla Theatre, McCarter Theatre, Long Wharf Theatre, Shakespeare Theatre (D.C.), San Francisco Opera, Houston Grand Opera, Canadian Opera Company, City Opera (NYC), and the Welsh National Opera. Ms. Oliver received her BFA from the California College of Art and her MFA from the Yale School of Drama. Everett Elton Bradman’s 2018 composer/sound designer credits include African-American Shakespeare Company’s productions of Richard III and A Streetcar Named Desire, Faultline Theater Company’s Where the Boys Are, and Skeleton Crew at Geffen Playhouse. Other adventures include Skeleton Crew at Studio Theater in Washington D.C.; music direction for As You Like It at the California Shakespeare Theater; music for Winter’s Tale, also at Cal Shakes; music/sound design for Thurgood, at the Lorraine Hansberry Theater; and assistant sound-designing The House That Will Not Stand at Berkeley Rep and Detroit ’67 at Aurora Theatre. Elton’s resumé also includes music for Lincoln-Mercury, the San Francisco Mime Troupe, the New Pickle Circus, as well as bass work on Madi Das’s Grammy-nominated 2015 album Bhakti Without Borders and performances with Oakland’s very own MoonCandy, featuring Valerie Troutt. Jessica Berman is a dialect, voice, and text coach. With MTC she has coached The Wickhams, Oslo, Shakespeare in Love, Thomas and Sally, The Legend of Georgia McBride, Native Son, Miss Bennet: Christmas at Pemberley, and August: Osage County. Other recent dialect and vocal coaching credits include: Paradise Square: A New Musical, Angels in America: Parts One and Two, What the Constitution Means to Me, Monsoon Wedding, An Octoroon, Watch on the Rhine, and Hand to God (Berkeley Rep), An American in Paris (North American Tour, 2017), The Eva Trilogy, The Baltimore Waltz, Sojourners, and runboyrun, (Magic Theatre), and The War of the Roses and Fences (Cal Shakes). Jessica currently teaches at University of California, Berkeley, American Conservatory Theater (Summer Training Congress and San Francisco Semester), and Academy of Art University. She earned an M.A. from the Birmingham School of Acting, and an M.F.A. from the Royal Central School of Speech and Drama.